Only a limited amount of finger or hand control is required to operate these valves independently. Finger loops or a crossbar may be attached to te lever for individual requirements—see Figure A. Fits Urocare® Reusable Latex Leg Bags and Urocare® Male Urinal Sheaths only. reusable latex leg bags and Male Urinal Sheaths. 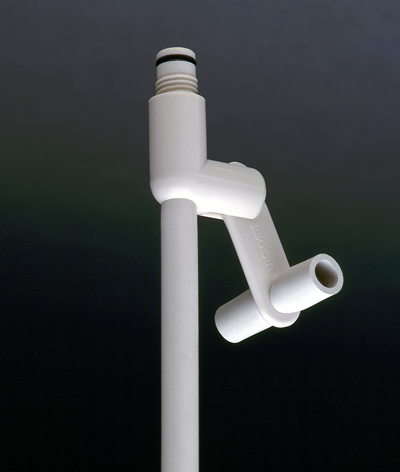 An effective crossbar can be made by cutting 2" (5cm) from the bottom of the drain valve tube and pushing one end through the hole in the lever until it is centered, forming a “T” shaped bar. Click on “Item/Ref #” for specific item details.